“Biography, a trade in the silliest anecdotes, in unprovoked abuse and senseless eulogy,” that quote certainly caught my eye the other night, having spent more time than I care to admit trying to write some life stories. The quote that jumped off the page came from Samuel Taylor Coleridge, writing in England during the Napoleonic Wars. Yeah, that’s the guy who did the Rime of the Ancient Mariner, required reading even in the American Midwest although there were no albatrosses on the Great Lakes, and Kublai Khan, the unfinished opium-driven poem that he couldn’t get down on paper fast enough before he forgot how it ended. To be honest, I pretty much avoided reading and certainly studying the English Romantic poets as a school boy and college student although hints of their personal lives occasionally caught my attention. Byron swimming the Hellespont was cool; that’s four miles, gang; and Percy Bysshe Shelley marrying Mary, the author of Frankenstein, was an interesting factoid; admit it, Boris Karloff defined the monster, until Peter Boyle came along much, much later. I came upon the biography quote in Richard Holmes’ Coleridge Darker Reflections, 1804-1839, (New York, Pantheon Books, 1998). Although I had heard of Holmes’ biographies, I had never read any of them — the aversion to English Romantic poets continued down through my ages. I need to add I had and still have almost no interest in the American Transcendentalists, the latter-day cousins of the British romantics. Being on the visual DL and not able to drive that day and like so many others, I was waiting for a ride home from Lillian. I had finished going through census slave schedules from the 1850 and 1860 censuses for a handful of slave holders in Florida and Tennessee for a biography I am working on. With time on my hands, I picked up the New York Review of Books, not a periodical I usually read, but I had already read the two print newspapers at home we subscribe to and someone else had snatched the New Yorker from the current issue rack [the nerve, I’m a taxpayer!]. Inside this edition was a ganged review of several of Holmes’ books, leading with the latest, This Long Pursuit, Reflection of a Romantic Biographer, (New York: Pantheon Books, 1916). This was his second autobiography or memoir, genres I usually only touch when I am researching since they are most often [I have found] filled with self-importance, self-deceptions, total lies, half-truths, gossamer myths, venomous [sometimes contemptuous or a cocktail of both] spite — and I am talking about the good ones here. Though Augustine of Hippo (a Catholic saint) might be exception in his Confessions (in Thirteen Books — for all of us who had to do some translation of them) and Ulysses S. Grant’s Personal Memoirs for all us American-English readers might be the exception to prove my self-created stereotype rule. I found the Holmes book in the library and checked it out. 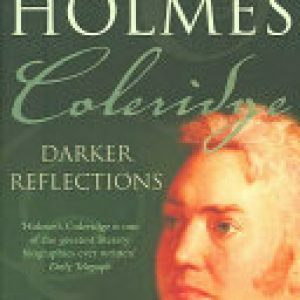 It was a wonderful story of the lengths he went to in writing his two-volume biography of Coleridge, i.e. going to where the “lotus eater” carved his initials S.T.C. into the sides of a cave to make sure they were still there caught my attention [Others had checked the cave out earlier]. There were also a series of sharp, short portraits of British Romantic-era poets, scientists and political figures rounding out the work. What a delight it was to read, and that led me into more of Holmes’ work, first Age of Wonder, mostly out of curiosity about Michael Faraday who played a major role in the laying of the first transatlantic telegraph cable — important in some of my earlier work, and then into Coleridge. Nah, didn’t start with volume one; jumped right to the good stuff in the Darker Reflections — broken marriage, spurning mistress, loving his kids who are scared of him, warring with the Wordsworths who provided shelter and company and encouragement, alcoholism, opium all day — every day [except when he ran out of other peoples’ money or was binging on rehab], etc. And there in the second volume was that great quote about biography. Coleridge was writing from experience, since he also wrote slice of “life stories” — especially interesting speculations on Martin Luther and St. Teresa of Avila [full of visions] as well as poetry, political journalism, travel books and criticism.